On Wednesday, February 24th from 4-7pm, our San Francisco flagship showroom comes to life with another multi-sensory event! Join us as we chime in the Spring season with the brand new Shadow table collection which features exquisite local walnut slabs milled and seasoned at the Studio Roeper sawmill. Mingle with other top San Francisco design professionals, including SFC&G Editor-in-Chief, Alisa Carroll, and Handful of Salt Founder and Editor-in-Chief, Regina Connell. Chat with Florian Roeper, Founder and Senior Craftsman of Studio Roeper, and discover the possibilities of custom, locally handmade furniture. 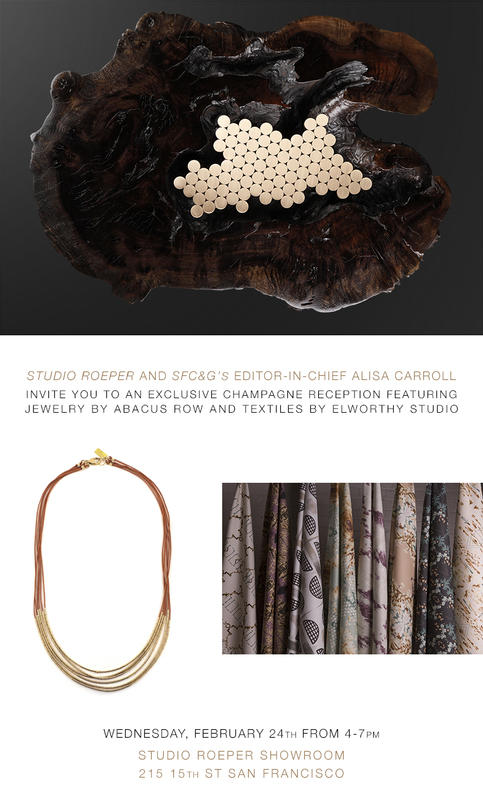 A talented group of designers will be complementing the furniture collection: Abacus Row-jewelry; Windy Chien-lighting; Elworthy Studio-textiles/wallpaper. Sip champagne and munch crispy, freshly-made waffles!